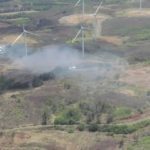 Wind industry leaders tend to dispute this information, but there is currently no international regulatory organization requiring them to report turbine accidents and failure. There are, however, various organizations committed to tracking and reporting turbine accidents. Caithness Windfarm Information Forum in Scotland is one such organization. From 2000 through September 30, 2018 (the end of the third quarter of 2018) Caithness has reported 330 turbine fires, including 19 so far in 20182. Although lower than the 117 annually claimed by researchers at Imperial College London, the number is large enough to reinforce the need for regulatory oversight. Caithness derives information from accident reports, insurance documents, and news articles. Why is accurate reporting of great importance? 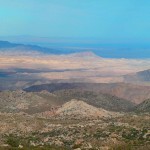 In California, exploded turbine blade pieces were reported to have flown 4,200 feet. Imagine this scenario with flaming blade debris. Further, due to turbine height, fire brigades are unable to reach the flaming gear boxes, nacelles, and enormous blades. 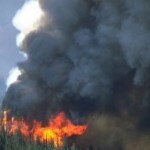 Widespread flaming debris is also difficult to contain. Often, the only option is to stand by and watch these fires burn. 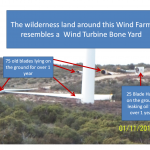 Destruction of property surrounding the turbine fire is not unusual, especially in dry, windy conditions. An example of this is the famous Australian fire of January 17, 2017; the fire resulted in the destruction of almost 3,400 hectares, or 8,401 acres. Included in the damage was a house, 300 hectares of pasture, 80 hectares of crops, 3 sheds, water tanks, and more. 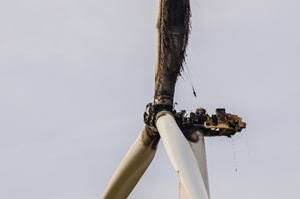 To demonstrate how simply a fire of this magnitude can be started, it was determined that a bird flew into the wind farm high voltage line, caught fire, dropped to the ground, and ignited the spreading fire. It’s more common for fires to start in the turbines, due to either electrical or mechanical problems. Electrical causes typically result from transformer and power converter systems that arc around cable terminations made during manufacturing. Other electrical fires result from improper operations and maintenance practices.Mechanical causes are primarily a result of hydraulic brake systems and main shaft bearings that overheat; this tends to occur in high winds, during stormy weather, when the blades spin out of control and the brakes overheat and fail. Lightning strikes are a well-documented fire hazard. Not all lightning strikes ignite turbine fires. However, it’s conceivable that, as turbine bases climb higher and blades grow longer, so does their vulnerability to lightning strikes. 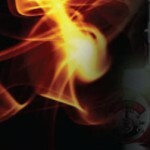 The sparking with flammable fluids or vapor clearly poses a fire risk. With more than 80,000 turbines currently in operation5, turbine fires will continue to increase. 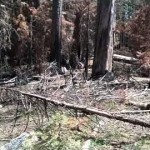 The industry has a long way to go in preventing, tracking, and reporting turbine fires. Everyone who lives in the shadows of these giant machines deserves protection to property, livestock, the wildlife, and surrounding fields and meadows. Burned out and rusting turbines not only mar the landscape, but also the reputation of a growing industry. Suzanne Albright is a Founding Member and Principal of the Great Lakes Wind Truth organization. She is also Executive Member of the group Turbines on Fire. 3Jared Paventi, Fiberglass Breathing Danger Effects, Aug. 14, 2017.